These simply chic birds are cut from 100% eco-certified felted wool and shipped flat for efficient delivery. A set of two birds — one each in white and red — costs $18 at Branch. Upcycled from discarded potato chip wrappers, these fairly traded ornaments are crafted by artisans in Nepal. Available in silver or multicolored variations, ornaments come in a circle or star shape. Get them at BTC Elements for $10 each. Made of gourds grown in the coastal valleys of Peru, these fairly-traded gourds allow Peruvian carvers to continue a traditional craft. Each ornament’s unique and will vary in size and shape. A set of three gourd ornaments costs $18 at Global Exchange. Amenity ornaments are printed on a hemp-and-organic-cotton blend fabric with nontoxic inks, then filled with spun recycled plastic bottles. Pick from a bird, circle, moon, or star in gold, silver, moss, or espresso at Amenity for $9 an ornament. 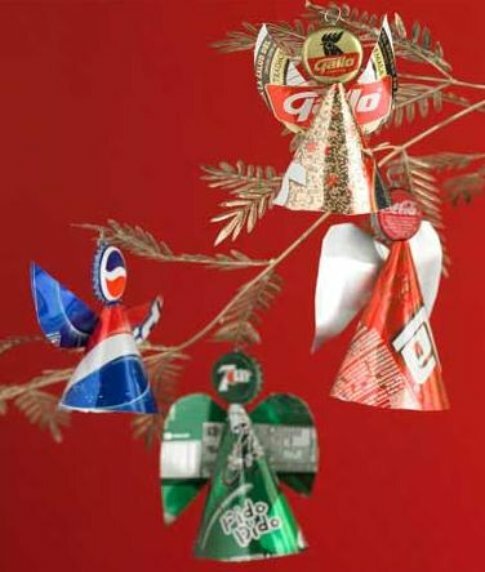 These upcycled angels are made from used beverage cans by a fair trade co-op in Guatemala. (via Belle Vivir) A set of four costs just $29 at VivaTerra. I renew my annual plea, if you REALLY care about the Earth, don’t decorate at all. Great read. I like seeing ways that we can all go green without spending too much of it. I also love the fact that we are finding ways to blend beautiful styles while lessening our damage to the environment. Going Green is starting to become imprinted into people’s minds. There are a ton of great Green Home Decor products being released and it should be a big theme for decorators in 2009.